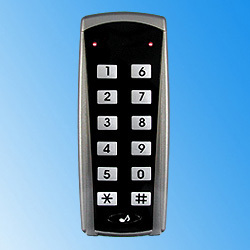 * ABS case with plastic keypad, compact and low profile. * With tamper switch and one loop sensor input to trigger alarm when case is tampered or loop is intruded. * Non-volatile memory for 10-100 years data retention without any battery backup. * DC 12V operated therefore battery operation is possible when AC power is interrupted. * Intelligent programmable functions through keypad by LED's and audible beep's indication. * 150(PG-104KC) and 7(PG-104K) independent codes from 4 to 8 digits, up to 99,999,999 combinations. * Programmable door release time, alarm time from 1 to 99 period through keypad. Pass code: Programmable from 4 to 8 digits. Monitor outputs: Door contact, Exit push button, Case tamper. Power requirement: 12V DC 18.2~20.2mA. standby, 49.7~54.9mA on relay operation. Humidity: 20%~90% RH, Non condensation.